Japanese Episode BW 038: "Zorroa the Movie! The Legend of the Pokemon Knight!!" American Episode 1438: "Movie Time! Zorua in 'The Legend of the Pokémon Knight'!" Satoshi and his friends run across a Zorroa while on their way to Raimon CIty. After the pokemon displays its ability to take the shape of both humans and pokemon, it runs off. Satoshi-tachi find out that the Zorroa's trainer is an aspiring film director named Luke and that he wants to use its special abilities to help him complete his movie. Unfortunately, the pokemon has a tendency to run off during filming, preventing him from getting any work done! After tracking Zorroa down again, Satoshi-tachi figures out that since Luke's pokemon is a female, it only wants to play the female roles in the film. Luke apologizes and promises not to make Zorroa play any of the male parts and enlists the aid of Satoshi and his friends to help him finish his movie. The team works together on a new script and, before long, begins filming for "The Legend of the Pokemon Knight!" A number of new scenes are shot with Satoshi as the Pokemon Knight, Dent as the evil pirate, Zorroa as Princess Yuria, and Iris as the Dragon Master. Filming is interrupted when the Rocket-Dan attempt to catch Zorroa, but the pokemon uses Night Burst to send them running away. Production continues until Luke's film is finally ready to be shown in public! After opening night, Luke's friend Matthew tells him about an upcoming tournament in Raimon called the Don Battle. 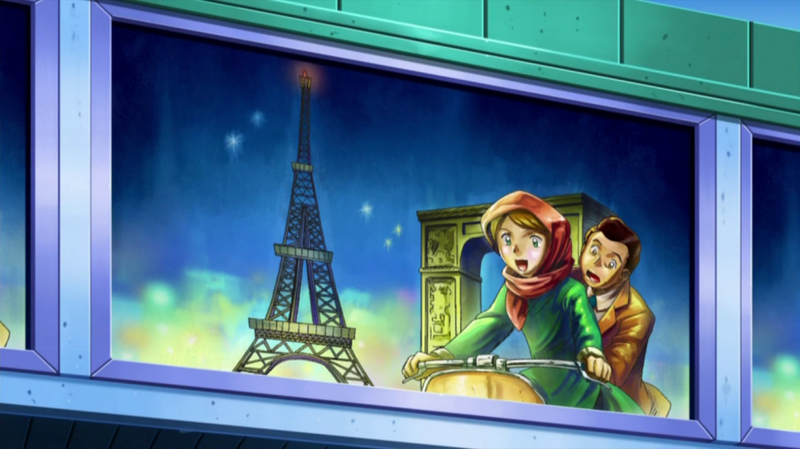 Satoshi, Iris, and Dent all decide to enter as well, so the four trainers head continue toward Raimon City. When a show has been running as long as Pocket Monsters has, certain plots are bound to be recycled. The plot of this episode, where the gang drops everything to help a bespectacled Yukinari make a movie, for some reason, is similar enough to the plots of other episodes that it may seem like a retread. This isn't necessarily a bad thing, though! This franchise has proven, time and time again, that it is possible for the remake of an episode to be superior to the original on which it's based. I don't think I'm ready to say something like that for this particular episode, but I will say that it manages to be a fun episode without giving off too much of a "been there, done that" vibe. The main draw of this story, I think, is seeing Satoshi and his friends acting like other people. Dent and Yanapp play great villains, and seeing Iris as a princess at the end and referring to her traveling companion as Satoshi-sama is about as un-Iris-like as you can get. I'm not really down with the BS "Satoshi has stage fright" thing since I find it to be horribly out of character for a guy who participates in large tournaments and doesn't mind stripping down to his underwear in the middle of the street, and the "Dent is an Everything Sommelier" bit is getting old. And I do wonder what Luke was planning to do about Zorroa's inability to deliver any of its lines before Iris showed up. But when you have the characters being as entertaining as they are, it's easy to ignore these minor annoyances. One of the things I've noticed about Best Wishes is how it doesn't really do parodies or homages anymore. I think a large part of that is that the writers had the Rocket-Dan deliver most of these pop culture references and that their death at the end of Diamond & Pearl pretty much put an end to that, but I also think they've just been avoiding them to make the show easier for foreign markets to dub. There have been a few jokes in the series so far, like the Kyojin no Hoshi reference with Don George at the end of that one episode, but Best Wishes doesn't seem to want to do the same type of humor its predecessors did. This episode, however, gives us a number of parodies, from the vaguely Yu-Gi-Oh!-esque opening to all the movies Zorroa is seen watching during that flashback. And I'm pretty sure this movie poster is supposed to be a parody of something, right? After going so long without references to real world stuff like this, it's refreshing to see the that the writers haven't forgotten how to do so. Oh, and the Rocket-Dan is actually not terrible for a change! They're not quite there yet - if this was an episode of any other series, they'd have been in on the whole acting thing just like everybody else - but this is certainly the closest they've been to "in-character" since the series started. The English version keeps Luke's name intact, which makes a ton of sense but is for some reason a rare practice in this show. I'm kind of scratching my head at why Matthew had to become Mr. Matthews since it really is just change for the sake of change at this point. I'm still bugged that TPCI uses Zorua since that's not the pokemon's name, but there really isn't a whole lot that can be done about that at this point, is there? Zorroa keeps its Japanese voice. The title of the movie the trio is watching at the beginning of the episode is called (deep breath) Mirakuru Faitaa Za Muubii Paato Twentii Foo Mirakuru Shuutaa no Nazo (ミラクルファイター・ザ・ムービーパート　トウェンティーフォー　ミラクルシューターの謎), or "Miracle Fighter the Movie Part 24: The Mystery of the Miracle Shooter." It was changed to "Wonder Fighters The Movie, Part 24: The Mystery of the Wonder Launcher" for the dub. Cilan: "Zorua can look like any Pokémon it wants to. But it can only use its own moves." Originally, Dent states that Zorroa can't copy other pokemon's moves. I'm bringing this up because the dub dialogue makes it sound like Zorroa is still able to use its attacks even when it's transformed, something the Japanese version never implies. I mean, can you imagine Zorroa, as Princess Yuria, slapping her hands on the ground and creating a Night Burst attack? Weird. Luke: "I forgot to introduce myself. I'm Luke. See, my dream is to become a big time movie director. And this is my assistant, Golett." Gobit is Luke's assistant director, but I guess the dub didn't have enough mouthflaps to fit that extra word in. Princess Yuria's name deserves a special mention here. Her name is written out in Japanese as Yuria (ユリア), which is what TPCI ended up going with. But, the name Yuria is really just the way Japanese people say the name "Julia" in their native language. They get the "Yuria" pronunciation from the European pronunciations of her name where the J makes a Y sound, not from the American pronunciation where it's said with a strong J sound. The dub isn't really wrong in calling the character "Princess Yuria," but it does seem odd that it would go with the more Engrish-y sounding transliteration of her name rather than the one that most Americans would be familiar with. Next up, filming for the movie starts. Kaizoku Dento (海賊デント), or "Pirate Dent," becomes "Captain Cilan" in the dub. While Cilan is referred to as a pirate on one occasion, Dent is never referred to as a "captain." Iris' role, Doragon Masutaa Airisu (ドラゴンマスターアイリス), or "Dragon Master Iris," is the same in the dub. Satoshi's role in the movie is Pokemon Naito Satoshi (ポケモンナイトサトシ), or "Pokemon Knight Satoshi." 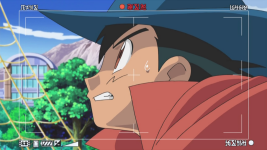 Dub Iris addresses him as "Pokémon Knight Ash" on one occasion, but he's called "Sir Ash" in the rest of the episode. This kind of creates this extra connection to "Lucario and the Mystery of Mew" that doesn't exist in the Japanese version, and I'm thinking TPCI added this because Ash is basically wearing Sir Aaron's outfit as it is. When Satoshi is too nervous to deliver his lines, Dent tries to calm him down by reminding him of the film Desumasu no Kamen (デスマスの仮面), or "The Mask of Deathmas." My guess is that this title is an homage to Garasu no Kamen, especially considering how much Dent's plot synopsis matches with Garasu no Kamen's story. The English version calls this same movie "Yamask of the Opera," which is a play on The Phantom of the Opera. Which, if we take Cilan's synopsis into consideration, means that the Pokémon world's version of Phantom features Christine Daaé as an actress who has a passion for acting, and who is also being stalked by a deformed Yamask who lives in the cellars. Or something. Luke: "Basically, Cilan is saying "give it all you've got."" Ash: "That's what he meant? No problem!" Here, Luke tells Satoshi to try with all his might. Satoshi responds by saying that "trying with all his might" is one of his specialties. Dragon Master Iris' scene, Take one! Dragon Master Iris: "Hear me, Pokémon Knight Ash! If you want to defeat Captain Cilan, first you must battle and defeat Axew, the most powerful of my dragon-type Pokémon!" Dragon Master Iris: "Axew, the most cherished and powerful of my dragon-types!" Iris recites the exact same line during both takes because she's reading from a script. I guess the dub forgot this and decided to have her ad-lib one of her lines by mistake. Next, Ash shows Iris his "heart." Sir Ash: "Thunderbolt! Show her what you're made of!" Satoshi never orders Pikachu to use 100,000 Volt in the Japanese version of this episode. Pikachu is just told to show Iris its heart, and using 100,000 Volts is just how it decides to do so. Cilan: "It's ad-lib time! The three evil villains who controlled me all along have finally showed themselves. Team Rocket!" This is the second episode in a row where TPCI's had Cilan say his catchphrase in a place where Dent did not! Maybe TPCI is trying to make up for all those times they removed his catchphrase in early Best Wishes? Originally, Dent just says "we'll ad-lib it from here," all normal-like. Dent's alter ego when he's fighting the Rocket-Dan is Pokemon Madoushi Dento (ポケモン魔導士デント), or "Pokemon Sorcerer Dent." The dub keeps this the same. Narrator: "Receiving rave reviews, "The Legend of the Pokémon Knight" has made our heroes a huge box office success. But not to worry, our heroes' Unova Region journey continues." The narrator doesn't say anything about the movie being a critical success in the Japanese version.